I captured this image of a rainbow last Friday, which turned out to be one of those days we sometimes get in this part of Grey-Bruce counties where the lake effect from Lake Huron has the skies cycling between sun and showers all day long. At the time, a week ago, I recall thinking this was the rain precipitation equivalent of snow squalls that come in the winter. Fast forward to this Friday and here’s what things looked like as we got the first taste of winter. The overnight temp plummeted to -12 (!) as strong winds swirled through the pine trees creating an ocean-like sound of waves. Yes, I know, this blog is supposed to make you want to come stay here LOL. Well, if you like snow it will 🙂 Because when winter is grey and snowless (or grey yucky snow slush) in the GTA, there is a good chance it will be a pretty and pristine winter wonderland up here in the snow belt! 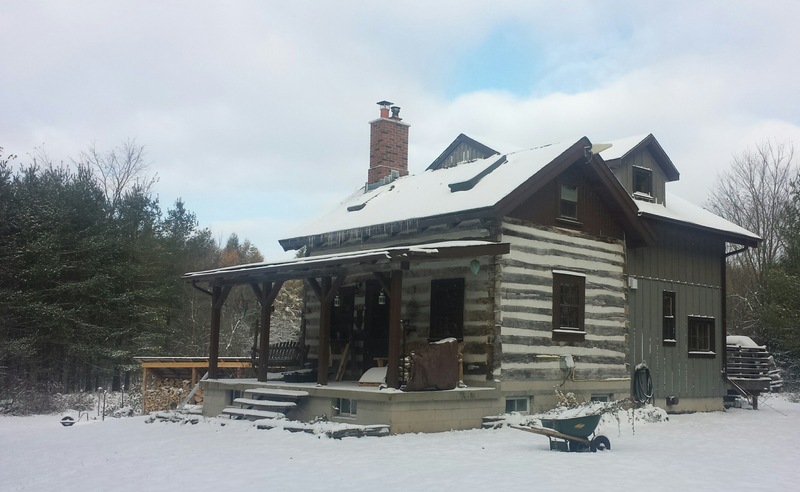 And the Cordwood Cabin is the perfect cozy little spot to snug down with the woodstove on and a book, a glass of wine or pot of tea, and a view of the snowy forest outside the windows in every direction!